systems and the latest industry standards. precise, preset, stable downstream pressure. the 42T is ideal for control of fire pump discharge. suitable for Fire & Gas monitoring systems. 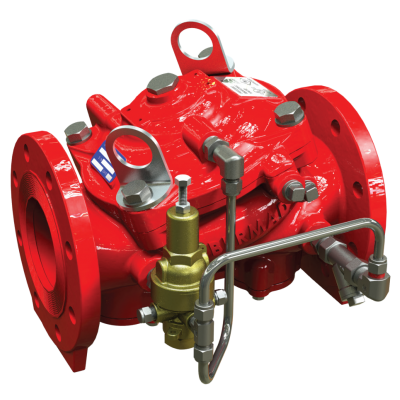 A typical installation of the BERMAD model 42T features a pilot valve for the automatic stable and accurate reduction of water pressure from a high upstream value to a preset lower downstream value, regardless of fluctuating upstream pressure or flow. Installed singly, the 42T provides a standard pressure-reducing system. Installed in parallel, two 42T valves provide high flow rates, redundancy, and zero downtime for maintenance. two-stage, high reduction in pressure and/or added protection to a reduced-pressure zone. To comply with the requirements outlined in the FM and UL standards, a pressure relief valve is to be installed on the downstream side of any approved or listed pressure reducing valve. The BERMAD 43T Pressure Relief valve is ideally suited for this purpose, as shown in the installation illustrations.